Water is one of its most precious resources, so understanding and preserving Arizona’s water bodies is vitally important. 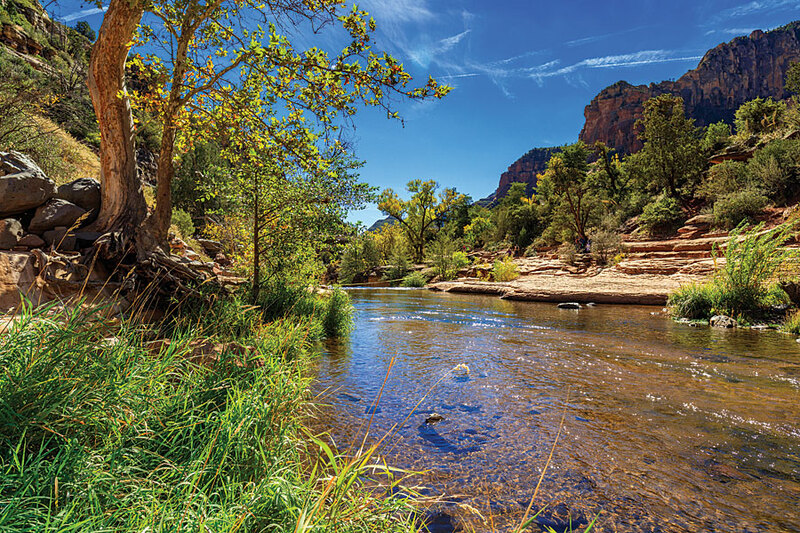 While enjoying Arizona’s recreational opportunities, residents and visitors can help preserve its streams, washes, rivers, and lakes in just a few minutes using a free smartphone app. 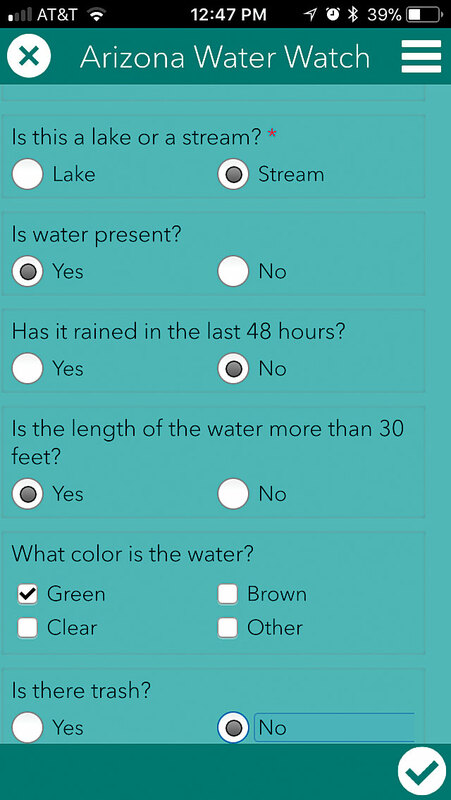 With the Arizona Water Watch Monitoring app, volunteers just answer simple yes/no questions about a nearby water body and take a couple of photos. The app, created in Survey123 for ArcGIS, uses the smartphone to automatically capture location and observation date. In just a few minutes, residents and visitors can contribute to the state’s well-being. Arizona is a desert state. Water is one of its most precious resources, so understanding and preserving Arizona’s water bodies is vitally important. The Arizona Department of Environmental Quality (ADEQ), a state cabinet-level environmental agency, is tasked with protecting the state’s public health and environment by preventing air, water, and land pollution and ensuring environmental cleanup through its planning, permitting, compliance management, monitoring, assessment, cleanup, and outreach activities. In 2016, the state enlisted the help of volunteers in this important work by launching a citizen science program called the Arizona Water Watch (AZWW). The program was started by ADEQ water quality scientist Meghan Smart. It trains volunteers to collect water quality samples from streams and lakes around the state and requires monthly time commitments and audits. This program has been successful, but Smart wanted to give volunteers a way to participate in citizen science at a less intense level. She thought an app targeting people who might not have time to collect water quality samples but could gather data when they were recreating would be valuable. Smart asked the GIS team at ADEQ if they thought they could create the app. Debby Crouse, a senior GIS analyst with ADEQ, said developing the app with Survey123 for ArcGIS took a little more than a half hour. Survey123 is a simple and intuitive form-centric solution for creating, sharing, and analyzing surveys that are fully integrated with the ArcGIS platform. Surveys can be filled out on the web or a mobile device, even when it is disconnected. Later, survey results can be securely uploaded to ArcGIS for further analysis when connectivity is restored. Residents and visitors can help preserve Arizona water bodies by using the Arizona Water Watch Monitoring app to answer simple yes/no questions about nearby streams, washes, lakes, or rivers. “Our GIS department has been working steadily to deploy many tools to our Air, Water, and Waste sections using Collector [for ArcGIS], Survey123, and online maps and apps through ArcGIS Online,” said Crouse. The Arizona Water Watch Monitoring app was the result of a brainstorming session at a meeting that had been called to introduce the available apps to some agency staff members. Released in November 2017, the Arizona Water Watch Monitoring app was designed for use by volunteers ranging from elementary school students to seniors. The app lets anyone become a citizen scientist and collaborate with professionals in scientific research. Since the existing AZWW program was robust and established, the app was well received. 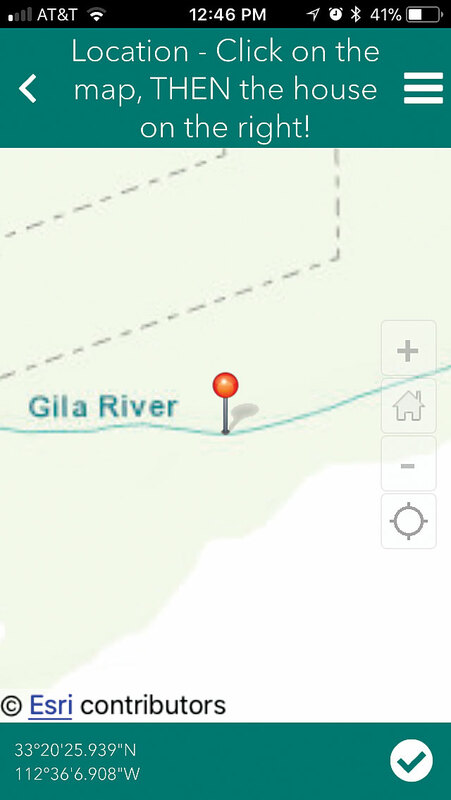 The data collected with the Arizona Water Watch Monitoring app is verified and added to a statewide GIS map that is used by ADEQ scientists to update flow patterns in streams and washes, address water quality issues across the state, and identify water bodies for future studies. “The data will be downloaded quarterly, shared on our website, and then used to update our flow regime GIS shapefiles annually. This will help keep our basemaps up-to-date,” said Smart. One of the things Smart thinks the app should be able to help ADEQ do is learn more about intermittent streams. These streams, which don’t flow year-round, are understudied. The smartphone automatically records the location, date, and time data with the survey form. The AZWW program benefits participants who have the opportunity to collaborate with scientists. Harnessing the curiosity and good intentions of people to solve today’s problems has helped citizen science grow and is part of a larger trend in a society that is becoming more peer-to-peer: people are increasingly makers as well as consumers. Through work on citizen science projects, the lives of nonscientists can be enhanced in a manner similar to the enjoyment they experience from participating in activities relating to sports or art. Thanks to the growth of the Internet and the nearly ubiquitous adoption of smartphones and other mobile devices, the kinds of projects that can benefit from citizen science have expanded. By collaborating with the public to crowdsource data and experiments, scientists can tackle projects that address both local and global problems in disciplines that range from astronomy to microbiology. Because so many crowdsourced projects involve data collection or verification, they are “what is where” activities that greatly benefit from the use of GIS, especially with the expansion of the ArcGIS field apps. The Arizona Water Watch Monitoring app benefits ADEQ by fulfilling several of the agency’s stated operational goals: deploying Lean Six Sigma management, leveraging e-technology, and increasing outreach. “The app is a great example of all three goals,” said Smart. For the past five years, ADEQ has been undergoing a Lean management transformation. It has been striving to reduce waste and improve services while protecting and enhancing public health and the environment in Arizona. The app improves the data collection process and decreases the time needed to update the GIS layers. “It embodies the very concept of Lean,” said Smart. The app has the added benefit of increasing public outreach by providing a less time-intensive way volunteers can help protect Arizona’s water bodies. Launched during the winter, usage of the app is expected to grow during spring, the prime time for enjoying Arizona’s recreational opportunities and fabulous weather. Not only are citizens using the app, but ADEQ staff are also using it while they are in the field.